There have been reports from world over of deaths while taking a selfie. The next time you’re standing at the top of a scenic cliff or on edge of a waterfall, think twice before you click that selfie. It could be the last thing you do on earth. Many times it seems like everything you indulge in and wherever you go is worth capturing, but there are cases where people went to an extreme level to click a selfie and ended by losing their lives. According to a new study conducted by the All India Institute of Medical Sciences (AIIMS), New Delhi, more than 250 people worldwide have died while taking a dangerous selfie in the last six years from 2011-2017. The findings analyzed 259 selfie-related deaths from October 2011 to November 2017. Of the 259 deaths, researchers found that the major cause of death is drowning, followed by incidents involving transportation. For example, taking a selfie in front of a running train and falling from heights. Other causes of deaths include animals, firearms and electrocution. The study found that India has the highest number of selfie-related deaths in all countries and more than 85 per cent of the victims aged between 10 and 30. 2018 saw several cases of selfie-related deaths. In May’18, a man in India tried to take a selfie with an injured bear and was mauled to death. On 5 September 2018, an 18-year-old hiker from Jerusalem died after he fell from 800 feet cliff at Yosemite National Park, according to ABC News. Hiker’s mother said he had been trying to take a selfie at the edge of Nevada Fall; a popular waterfall in the park. deaths while taking a selfie – How can we stop such attempts leading to a murderous selfie? You don’t have to do much, just stop posing in front of coming trains or any other transport. Do not try to jump on to unsafe structures just for the fun of taking a selfie. Avoid taking selfies on roads and highways. The country should implement “no-selfie zones” in dangerous areas, this could prevent their temptation to capture a life-taking selfie. 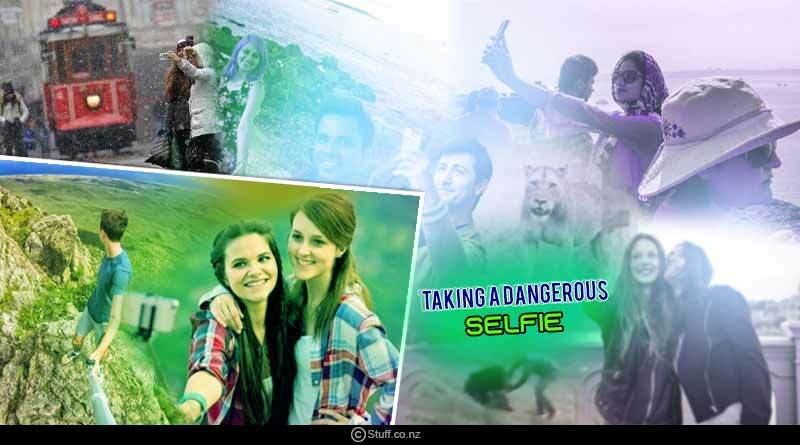 Selfies are not harmful, but the human behaviour that accompanies selfies is dangerous. Individuals need to be educated regarding certain risk behaviours and risky places where selfies should be taken and where it shouldn’t be. Russia started a “Safe Selfie” campaign, which featured the slogan, “Even a million likes on social media are not worth your life and well-being”. We can either promote such initiatives or begin campaigns of a similar kind. In 2016, Mumbai declared “no selfie zones” across the city following the revolution of selfie-related deaths. A national park in Indonesia announced to create a safe spot for photos after a hiker died taking a selfie. Therefore, we can conclude that adventure and risk are worth only for a noble cause, however, putting your life at stake and losing it will bring an end to the entire game. Refrain from taking selfies that can prove fatal. For more articles like deaths while taking a selfie, do Subscribe to our newsletter and follow us on Facebook, Twitter and Google+.